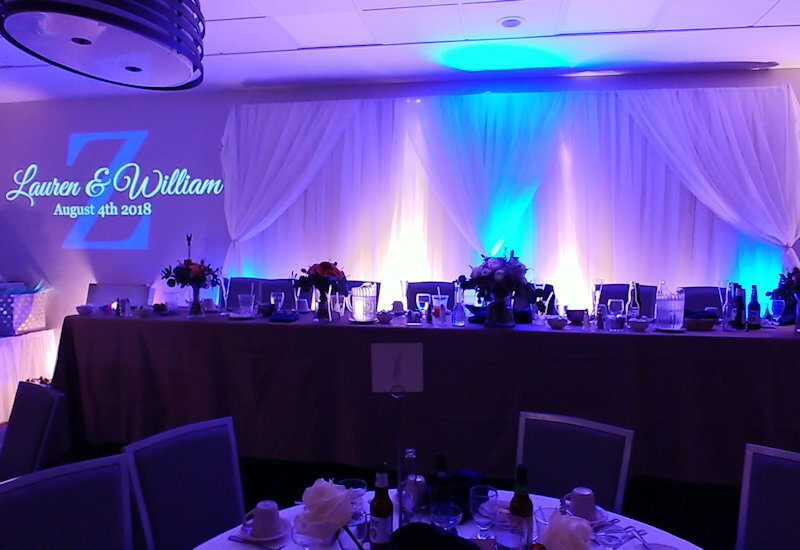 We can create a striking appearance when using a projected monogram in conjunction with subtle lighting backdrops. You Can Choose To Add It To Any Of Our Systems, As You Build Your Own Package. Another Dimension That Is Only "You"
Just about any design can be done digitally. Sure, most do a name, or date, or such. But it can be done to match a logo, picture, emblem, or more! 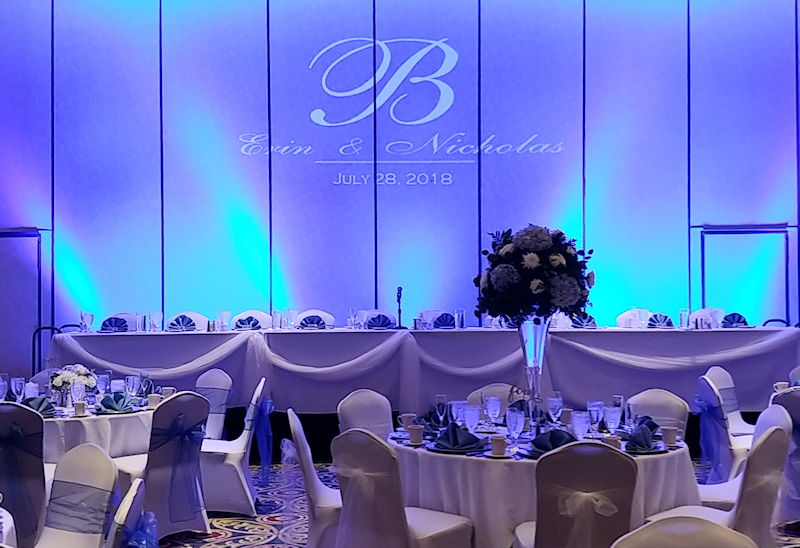 Size of the monogram can vary, depending on the room and layout. Mostly put behind the head table, with or without lighting. But can also be placed near the cake, or on the floor. 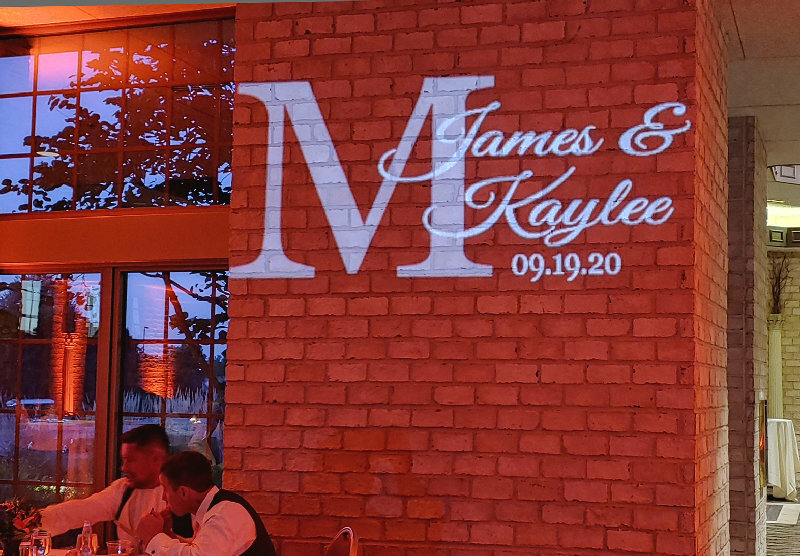 Best part is if on a wall your guests can take pictures under the monogram to remember the day of the celebration ! 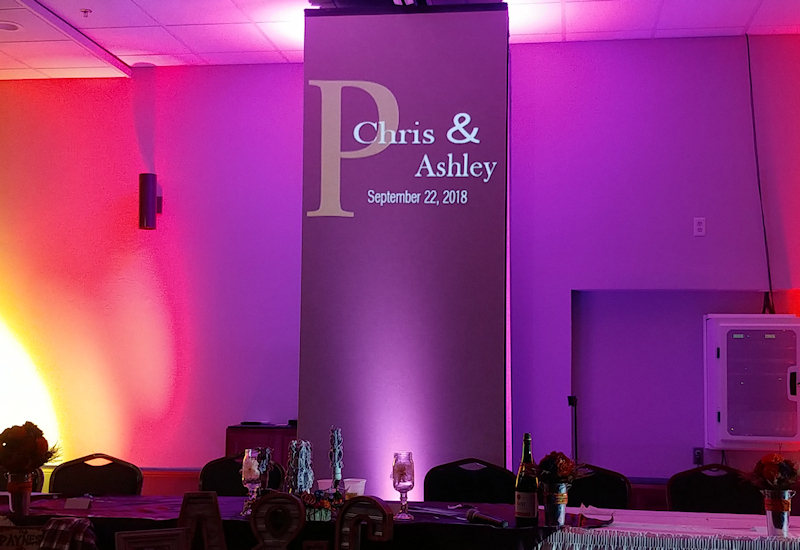 Monograms are usually projected on a wall, but can also be done on the floor, or even ceilings It can contain your names or event date, or just a graphic. We can give you some suggestions and even show you examples. The newest trend is to do "motion monograms". It's a projection that moves! As an example, for a winter wedding, perhaps your names projected with snowflakes falling. Maybe a streaking comet drawing out your names as it flies by! Just White On A Wall? Most of the time you see monograms in white. In our case, we can do colors if desired. 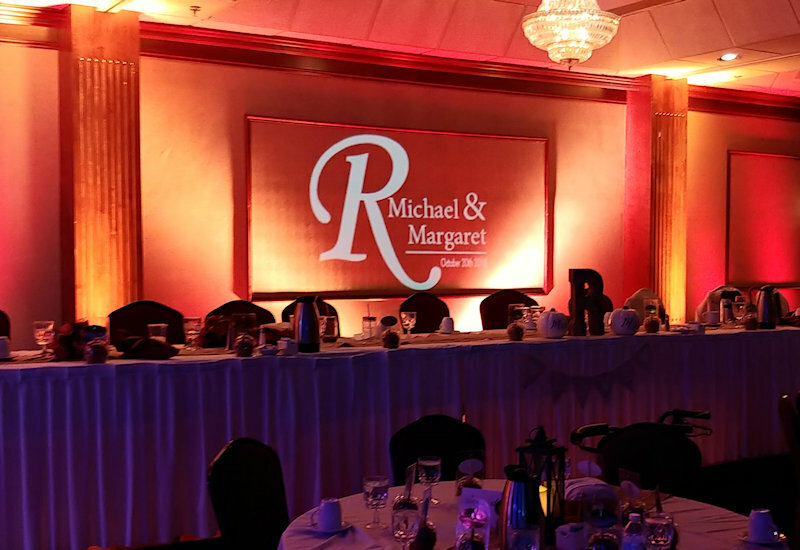 Our monogram service is ONLY available with Uplighting or with DJ service, not as an individual item. 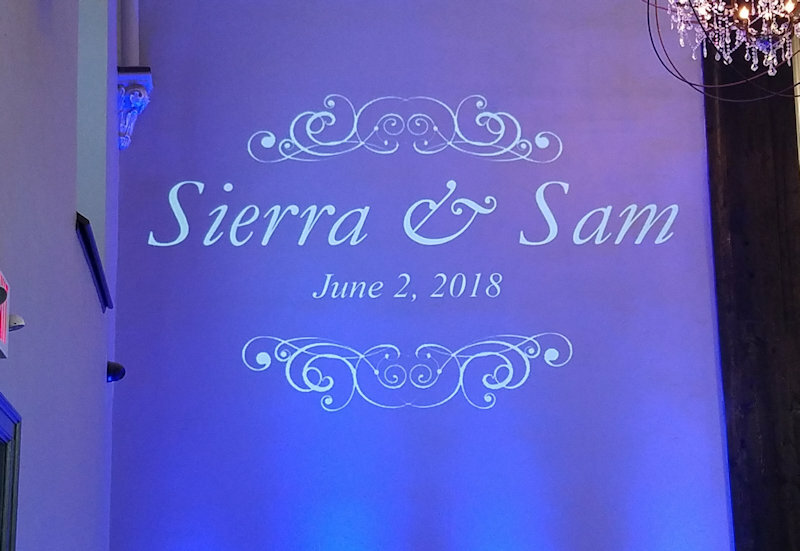 "Stenciling" can also be chosen to project objects such as leaves on a wall or dancefloor for a fall wedding, or stars projected on a ceiling overhead giving a unique atmosphere. 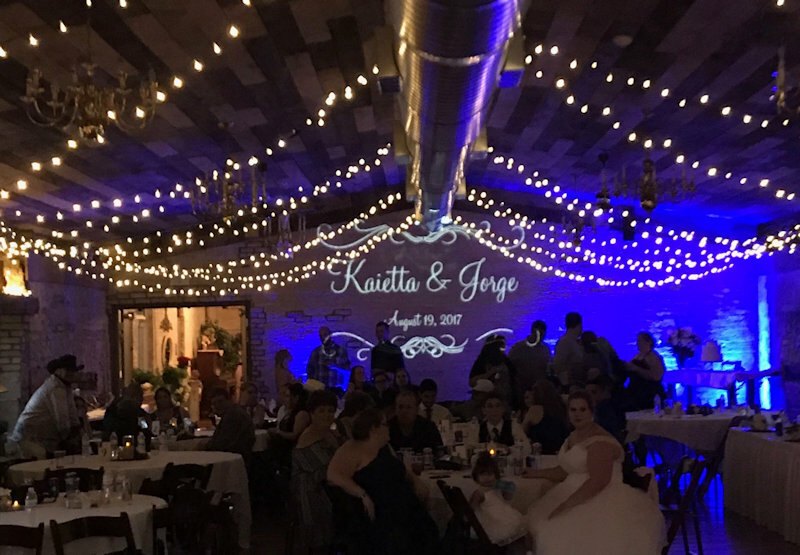 "We had them do the music for our ceremony, dinner and dance. All of it flowed so smoothly and I did not have to worry about a thing. It was great to be able to meet with them before the wedding and plan out what our vision was"
""I could not have asked for a better duo to work our wedding. They kept everyone on the dance floor and cared about every detail, even on the hottest day of the summer!" Erin C.